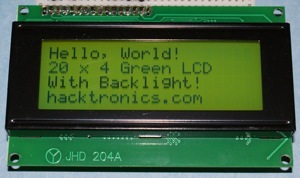 20 x 4 LCD, 5 volt, based on the popular HD44780. Black characters on green background, with back light. 4 rows, 20 characters per row. We even include the header pins and a resistor for the contrast pin. We're good like that. Are you going to use this LCD with an Arduino board? Check out our Arduino LCD tutorial for step-by-step instructions.